Bought new with an Ortofon MC25 cart. Already owned a Linn LP12/Lingo/ Ittok ll and a Systemdek llx900/ Rega RB300 but was attracted by the looks of this new in the market deck so on impulse and short listening bought it while on holiday in London. Not a bad sounding deck, not much wrong and nothing gets in the way of enjoying my vast collection of vinyl. Not in the same league as the Linn and a bit behind the Systemdek. I've always thought the 9 arm that came with it is a weak point, looks flimsy, lightish, and not solidly built or finished. True enough after 2 years of use the bearings gave way. I sidelined it since 2004 and always pondered the idea of installing a Linn arm someday as it shares the same three bolt Linn mounting, but there isn't much room to give clearance to any Linn arm. Fast forward Oct 2015, I dismantalled it and had the plinth laser cut and installed. Linn Basik plus arm and installed an Ortofon Kontrapunkt A cart. As suspected the 9 arm was a weak link. The deck is now totally transformed. Gone was the boomy bass and slightly muddled mids and less than clear highs. Betters the Systemdek by miles. The Linn LP12 is still tops, it's sweet clear mids, clear airy highs and warm mid bass are qualities few decks can achieve. The Perspective is clear too to bottom in a clear balanced way. Digs low bass as good as the Linn but loses a little of the musical character of that classic deck. I just wonder what would it sound with even better arms. I use a Project perspective with carbon arm/Sumiko BP2 cartridge/speedbox/Clearaudio smart phono pre amp(price: 1150 EURO). This is my first (serious) turntable ever!? 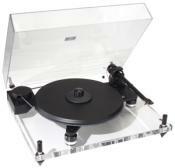 As a yound kid (30 years ago) I had a mono turntable. The sound is magical, bass is superb and mids and highs are also perfect. Beautiful deep and wide soundstage. Instruments sound like real just as voices..
Cd's and Sacd's are done for me. I don't like their sound anymore. Audio industry and hifi magazines have forced us to adopt new technologies. And it is getting worse and worse (mp3, downloaded music). Where does it end. Excellent sound and great isolation from outside vibrations. Beautiful to look at and quality build. Swapping motors for different speeds, and additonal counterweight needed for some cartridges. Purchased this absolutely beautiful turntable about 3 months ago and am floored by the beautiful sound that this unit produces when part of a decent sound system. The plexiglass and tonearm gives you a taste of "High End" at a pretty reasonable price considering the craftsmanship and overall feel. One word of warning which I will also list as a negative is that I have a Grado Platinum Cartridge installed which required a seperate purchase of a 3rd counterwieght because neither supplied counterweight would balance this cartridge correctly, so be forewarned. the other negative is that if you need to play 45 rpm records (Many new audiophile releases are now being produced at this speed) requires that the user remove the 33 1/3 motor and change to the 45 motor which although I kinda understand why they did it, is very annoying. All in all a superb unit when mated to a quality cartridge. Sound and imaging are magnificent...much more pleasing than CD's. Great sound, looks, simplicity and easy to set up. Well made. None really, anybody want to swap for a Clearaudio master reference?! Bought this second hand on Ebay UK last year (Pro-Ject Perspective), as well as a Trichord Dino phono stage. I'm now rediscovering my vinyl collection again, this beauty seems to be faithful to the 'groove' - bass is tight and powerful and the highs seem to sparkle. I've put an Audio Technica AT OC5 on and sounds great but I can't wait to try it with my Ortofon MC30 I had considered a Michell Gyro SE but have no regrets about picking up this bargain!